1600 Words A Day: Hurricane survival bonus! My street is eerily quiet this Halloween. You know it's rough when you live in a state where the governor has to issue a decree rescheduling Halloween. Okay, I know it sounds ridiculous, but the weather has been ridiculous, and as someone on Tumblr playfully observed, this isn't the first time. Last year, we had a blizzard on Halloween, this year, we had Hurricane Sandy. Next year? Who knows. 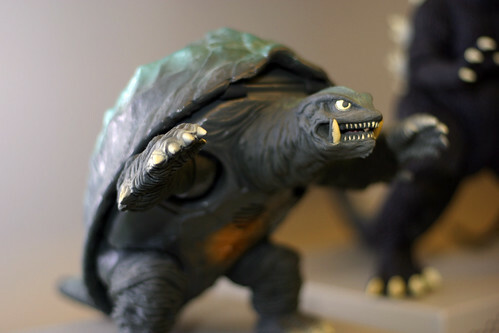 Maybe Gamera will rescue the children. The really bizarre part of all this is right before the hurricane, I was having fantasies of being at home and unable to leave or do anything. It sounded so Zen. Now that I've been stuck in the house since Sunday afternoon, it's getting to be a bit much. I actually got excited about going to Target to pick up a few necessities---not that many were left on the shelves to be had, but that's kind of a typical day at Target. The bread shelf was more empty than usual. Actually, what surprised me was what Target did have: tons of grumpy New Jerseyans clinging to their various electronic devices and doing what they usually do--ranting about price gouging, traffic, and having to listen to other people rant while pretending nobody else was within earshot. In other words, the state already seems well on its road to recovery. If anyone out there is concerned about how New Jersey will fair in the zombie apocalypse, I'm feeling confident that either we'll recover swiftly or nobody will notice the difference. Speaking of an apocalypse, what is it about people from New Jersey and cutting in line at gas stations, or other places, for that matter? In a place where the Mafia is a legitimate threat and new gangs emerging all the time, this seems unwise. My take: don't shove your way through line because you just don't know who you're shoving. One minute, you're shoving what looks like a frail old lady out of your way and the next thing you know, you have a severed horse's head in your bed. So not worth it!